With the picnics and BBQ’s going on this summer…here’s a potato salad that every one will be choosing to put on their plate! 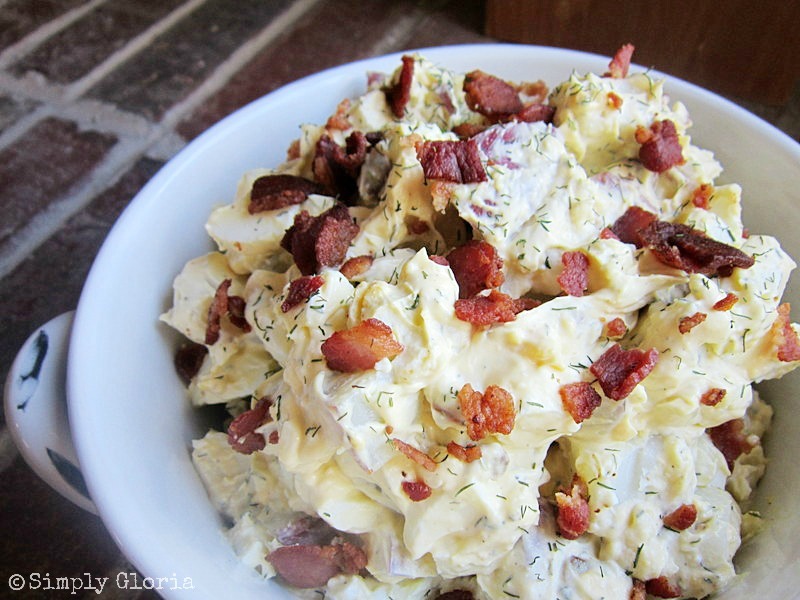 I’ve been making this Creamy Potato Salad With Bacon for as long as I can remember. 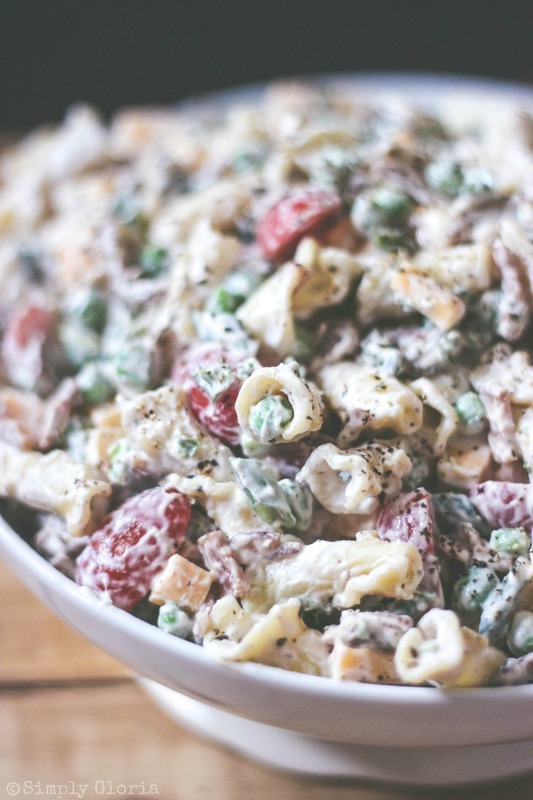 It’s a true favorite when I bring this salad to gatherings or even when I’m hosting a summer BBQ. But, it’s not just a summer side dish…my family loves it all year long. This potato salad (with bacon, remember!) would be the perfect dish to make for this Memorial Weekend! If you’re a bit competitive, you’ll be proud to have this beat all the other potato salads on the table. I know, every potato salad is a little different. It’s kind of like a family recipe that gets passed down, and down…and well, you know. You will not be disappointed at all! This salad has the perfect blend of flavoring with dill weed seasoning and BACON. The texture is very creamy. The potatoes used in this, are red potatoes. Not all potatoes are alike. I’ve tried this with Yukon white and gold, russets…you name it! (I’m from Idaho…so trust me, I know my potatoes!) But the Red Potatoes are the best! They hold their structure while still being creamy, and not becoming mushy! Putting this salad together is very simple. I promise you, it is NOT an all day deal! Start by frying up a pound of chopped bacon. While the bacon is cooking, scrub and cut your red potatoes into medium bite size pieces. Put in a large pot and fill with cold water. (Tip: Starting with cold water before the boiling process actually helps so the potatoes cook evenly as to not make the outer parts mushy.) Boil potatoes until tender, but not too soft. Drain, DO NOT RINSE. Lay drained potatoes in a wide baking dish with paper towels in the bottom. This allows them to start cooling faster. Start to boil 10 eggs (at the same time as you start the potatoes and bacon). Use cold water as well when covering the eggs in the pot. Once the eggs start to boil, turn OFF burner. (But leave pan on the hot burner.) Put lid on for 12 minutes…no peeking! (Tip: After the water has started to boil. Sprinkle 1 tablespoon of baking soda into the water. It helps the shells peel easier. Also, sprinkle 1 tablespoon of salt into the water. This helps with sealing some cracks in the eggs during the boiling process.) Peel the shells off the eggs. Cut the eggs in half and pop out the yolks, set aside. 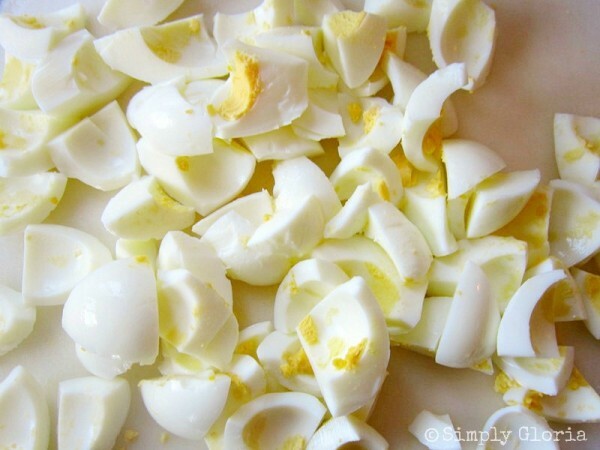 Cut the rest of the egg whites into bite size pieces. Put the yolks in to a large mixing bowl with the mayo, sour cream, dill weed, onion powder, salt and pepper. 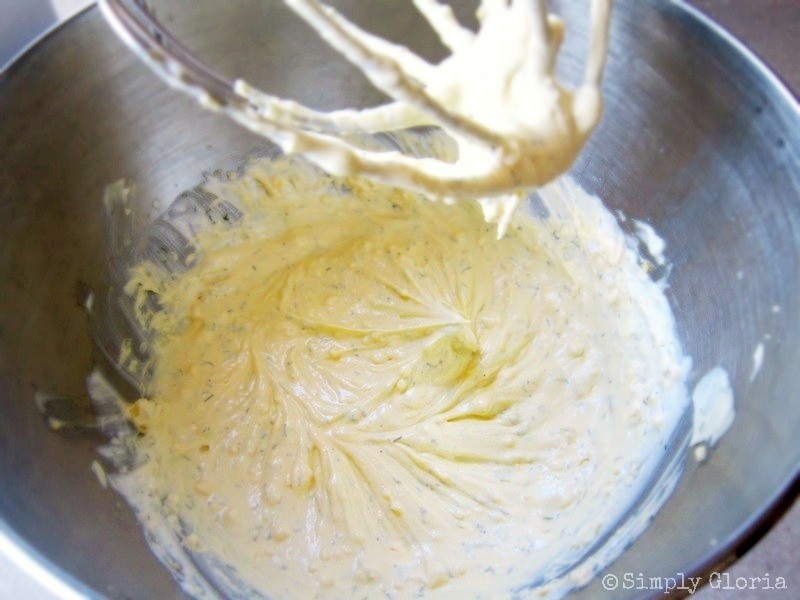 When the potatoes are cooled, add them to the creamy egg mixture. Add the chopped egg whites and crispy bacon. Stir and fold softly until all combined. Refrigerate until ready to serve. If serving outside, I will always put a larger sized bowl or container full of ice and set the bowl of this salad into the ice. It keeps it cool and safe for every one to enjoy! This salad will stay fresh kept in the refrigerator for up to 3 days. Cook chopped bacon in a large frying pan. While the bacon is cooking, scrub and cut your red potatoes into medium bite size pieces. Put in a large pot and fill with cold water. Boil potatoes until tender, but not too soft. Drain, DO NOT RINSE. 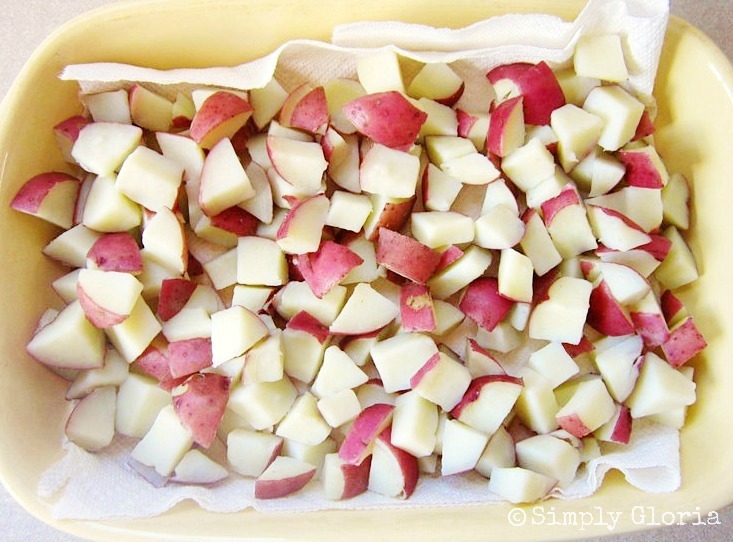 Lay drained potatoes in a wide baking dish with paper towels in the bottom. Start to boil 10 eggs (at the same time as you start the potatoes and bacon). Use cold water as well when covering the eggs in the pot. Once the eggs start to boil, turn OFF burner. (But leave pan on the hot burner.) Put lid on for 12 minutes. Peel the shells off the eggs. Cut the eggs in half and pop out the yolks, set aside. Cut the rest of the egg whites into bite size pieces. 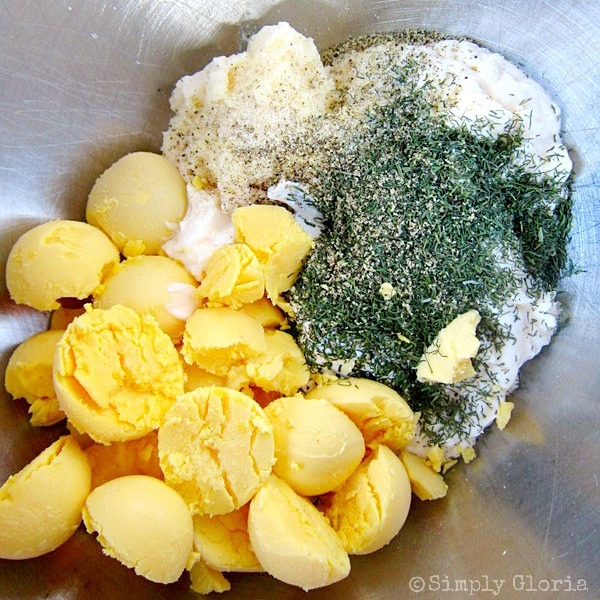 Put the yolks in to a large mixing bowl with the mayo, sour cream, dill weed, onion powder, salt and pepper. Mix together until creamy. When the potatoes are cooled, add them to the creamy egg mixture. Add the chopped egg whites and crispy bacon. Stir and fold softly until all combined. Refrigerate until ready to serve. *If serving outside, put a larger sized bowl or container full of ice and set the bowl of this salad into the ice. It keeps it cool and safe for every one to enjoy! Hard Boiled Eggs Tip: After the water has started to boil. Sprinkle 1 tablespoon of baking soda into the water. It helps the shells peel easier. Also, sprinkle 1 tablespoon of salt into the water. This helps with sealing some cracks in the eggs during the boiling process. This recipe was amaing!! crowd pleaser for sure!!! Gloria, this potato salad looks totally awesome! Great minds think alike, my friends, I have a dish with egg and bacon on Sunday that would go beautifully with you salad – so I think I’ll make both! Hope you and your family have a simply wonderful holiday weekend! Oh and pinning, of course! This is a great compliment to any BBQ item, Gloria! I make a similar potato salad but I do not put egg in mine. Not that I have anything against eggs, I’ve just never made a potato salad with them. This salad is perfect! Funny how every one’s potato salad is different. Some have mustard and olives, sometimes both! But my husband loves– wait for it…TUNA FISH in his! Crazy, I know. Hope you’re having a fun weekend, Julie! Well I can see why this is a favorite Gloria! Wow, especially with all the bacon. I think this is the perfect weekend to test out this salad! Bacon? YES!! Okay, now I have to have some of this!! Pinned! You’ll love it, Tonia. My favorite is when it is just freshly made…then it’s not too cold and extra creamy. Thank you so much Anne…hope your weekend is just as lovely! Mmmm, I love how tasty this looks!! Thanks Jocelyn! Hope you had a fabulous time at the beach this weekend! Hi Hollie!! You just made my day! Give Keenan a love for me! What is dill weed seasoning, it is just dried dill weed? Yes, it is dried dill weed. Thanks for stopping by Julie! Have a great weekend! 1/4 cup seems like way too much! Can that be right?? I’ve just made this for the fourth time as it is now my “bring a salad” salad. My family and I will enjoy this tomorrow as part of our Christmas feast! Belinda, you just made my whole day! (Actually, I read this the night you sent it… but got distracted with my little one.) 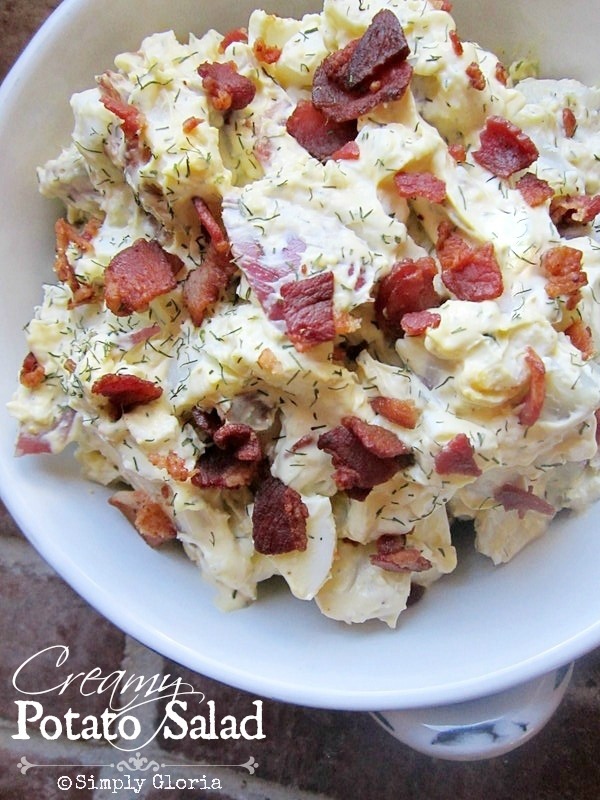 I’m so happy you and your family love this potato salad. That’s why I love sharing the recipes I’ve created and been making for years. Just so other families may enjoy what my family enjoys. I hope you and your family had a very Merry Christmas! And, have a most fabulous NYE celebration! Blessings to you! This was the best potato salad that I have ever made! New family favorite. I tried your recipe about a month ago and my fiance LOVED it! He says it tops his mom’s (hard to do) and is now his new favorite. Making it again this weekend for a family BBQ – hopefully it goes over just as well with my family as it did with my fiance… no reason why it shouldn’t as far as I’m concerned, this salad is declicious!!! I was so ready for a change from the family standard of the sweet pickle version. This was just delicious! So very easy to put together and so much flavor with so few ingredients. I did add some diced celery for a little crunch- and I had it in the veggie bin- but found no need to alter anything else. So happy with this potato salad! I served this potato salad at a sip and see this past Saturday and it was a huge hit. I did do a little variance as I am not a lover of dill. Instead of using the dill I replaced it with a tablespoon of dry ranch dressing . (5lbs of potatoes ) Also I didn’t add the eggs (I love them but new Mom didn’t) but I did add the egg yolks to the dressing. Just a nice refreshing new idea for potato salad. Loved it!!! What great adjustments! My boys would dig the ranch in it, too! Thanks for stopping by to let me know how it turned out for you. Have a most wonderful weekend! WOW! I just made this for dinner tonight and I think it’s safe to say that I’ve found my new favorite potato salad! It took a little longer to make than I expected but the flavor is AMAZING so I’m okay with it. My only real challenge was staying away from it until the ribs were done and my fiancé got home.